Tilt’s Canadian branch isn’t even a year old, but already the company is reporting huge growth among its Canadian users. The company on Tuesday announced that Canadian groups are collecting money every three minutes. What’s more, the company has seen 90% month-over-month growth in new campaigns. 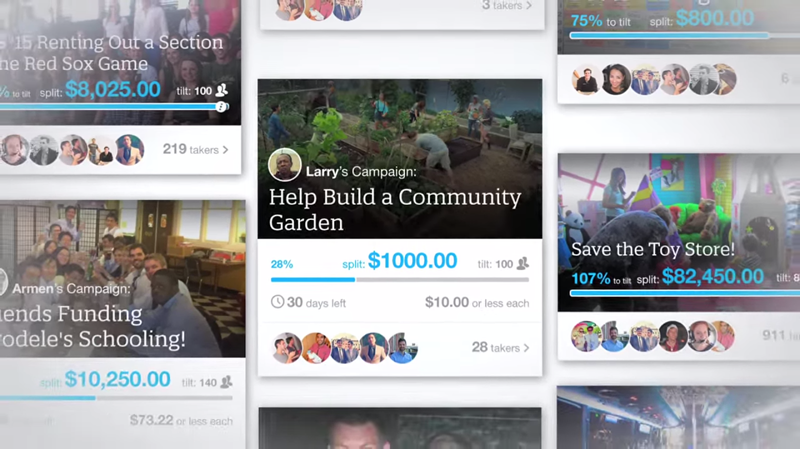 In case you missed its debut last June, Tilt is a service that allows people to fund projects or initiatives within their own social circle. The goal is to take the crowdfunding approach and shrink it down to a more personal level. Instead of funding companies, you’re funding people or more personal causes. Tilt calls it micro-groupfunding, and says the dominant activity is around smaller groups collecting funds from friends, family and colleagues. This is reflected in the average amount raised by a Tilt campaign. Users aren’t funding multi-million dollar ideas, like an Android gaming console or a VR headset, with hundreds or thousands of backers. Instead, the average Tilt campaign raises $480 with at least eight contributors and Canadians are using the service to raise money for team sweaters, birthday gifts, sports league fees, and Raptors tickets. Tilt said most Canadian campaigns are launched on Wednesdays between 1-2 p.m. EST and collect the most money on Thursday between 6-8 p.m. EST. Tilt arrived in Canada last summer, and its Canada offices are based out of Toronto. The company is headquartered in San Francisco and launched its first mobile application for iOS users in September. An Android version was promised “in the near future” but has yet to materialize.